Being a city dweller does not mean you cannot save the planet — or your food scraps. Climate change and resource management are big issues. Composting in any size space is not only possible, but it gives you a chance to reduce greenhouse gasses and reuse food scraps. Right now, about 40% of all food in the US goes to the landfill. In addition to planning meals and using your food in creative ways to reduce the amount that goes to waste, you can compost. When you think composting, bins and outdoor piles may come to mind, but there are several ways for city dwellers to contribute or get involved in composting. Here are some ideas. If you want to do your part and reduce your carbon footprint, you can save compostable waste and give it to friends, drop scraps off to participating farmers markets and urban composting projects, or pay for a pickup service that handles the drop-off for you. In some urban areas, composting projects are maintained by state and other non-profit agencies. In New York City, Santa Monica, and Boston, food scraps are collected and added to a civic composting project. Most municipal composting projects do not accept food scraps or products that have grease, fats, or oils. Other no-nos include dairy, cheese, meat and fish, cat litter, plastic bags, styrofoam, or cigarette butts. If you are running short on time, just drop your food scraps in the freezer and drop them off when it is convenient for you. The gold standard for small space composting is vermiculture, i.e., using earthworms called "red wrigglers" to do the job. It's easy, does not take a lot of space or expense, and processes food scraps pretty fast. Adventurer Alison Teal talks about how to make the good stuff--compost! Your compost bin could be a plastic box with at least a square foot of surface area. A rubber or plastic container works perfectly. Before you look for a container, think about where you want to store it — preferably someplace dark where it won't be disturbed too much, except when you are adding more scraps. A closet or under a bed works well (if the light smell won't bother you). Poke five or six holes in the top of the bin to be sure there is plenty of air. If you want, cover the holes with a screen to keep flies out, but it probably won't be a problem. Indoor temperatures are perfect for worms, between about 55ºF and 75ºF. Shred some newspapers to a width of about one inch, and add a handful or two of garden soil or compost, some green food waste, or leaves. Dribble and mix water into your bin until it is very moist, but not soaked. You should be able to squeeze out a couple of drops of water. Too much water and the bin will smell and your worms will die. Too little and your worms will dehydrate and die. Keep an eye on the moisture, and mist or water if needed. No puddles. When your prep work is done, fluff up the bedding — now you are ready for worms! An important point about worm composting is to ensure you use the right kind of worm. You are looking for the red wrigglers, Eisenia fetida or Lumbricus rubellus — using garden worms or bait shop worms will not work. All worms can die from rough handling so do not stir or shake up your compost bin once they have been added. Look for a store that sells composting supplies, or you can easily buy red wrigglers from online outlets like Amazon. When you are ready to introduce your red wrigglers, place some shredded food in the bin, and put the bin in a brightly lit spot. Gently shake out your worms and leave the cover off. The worms will burrow away from the light. In an hour or so, cover the bin and move it to a dark spot. It does not take much time or effort to maintain a worm composter. Just add shredded or ripped down scraps and keep their bedding uniformly moist. When the compost looks ready, push it to one side of the bin, and add fresh bedding and food to the other side. Over a few weeks, the worms will migrate to the new bedding, and you can carefully remove your compost. Use the compost on indoor plants, or give to others in your neighborhood or workplace for use with their plants or in their gardens. Sometimes discussed as a composting method, bokashi is fermentation process that produces food waste in a reduced form — pickled. The pickled waste must then be dug into a garden (buried for decomposition) or dropped off at a composting facility. 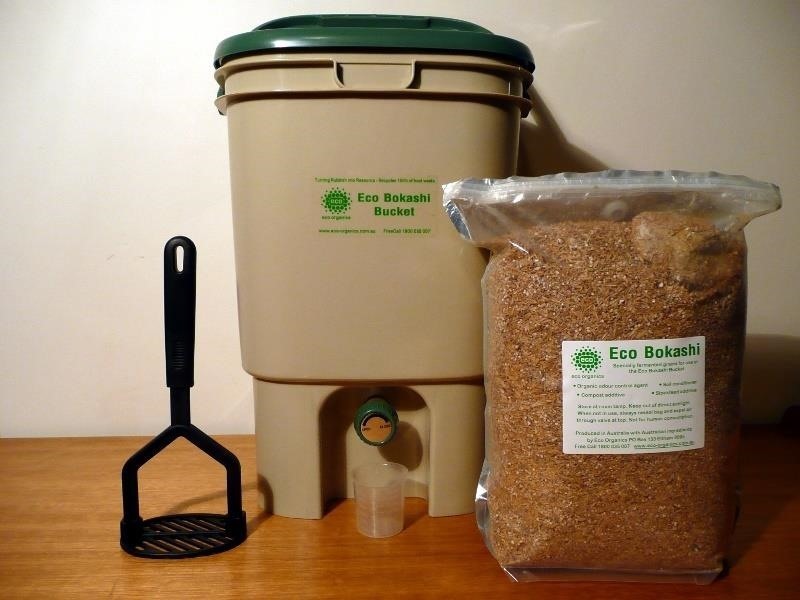 The bokashi process uses a bin with a spigot at the bottom, in which you drop your compostables. These bins can be found online in stores like Amazon. Some say that all your waste, including meat scraps, can be put into a bokashi bin. If you add meat, dairy, cheese, or oily products, remember not to drop it off at a composting facility that does not accept those materials. Burying this kind of bokashi output in your yard will likely attract rodents, and the same goes for placing it in your composting bin. So you can generally expect to put the same types of things in your bokashi bin as you do in a composter. After you have added some veggie scraps or fruit to your bokashi bin, sprinkle on the microbial bran mix that you buy or make. The mix contains anaerobic bacteria — the kind that does not need oxygen to live. You press on the bran and food waste to compress the air out. Over time, highly acidic liquid from the food scraps accumulates in the bottom, and you drain it off. This is not compost tea and will damage the roots of plants if directly watered into the soil. Bokashi material is purportedly "done" within ten days to two weeks. At that time you can bury it in your garden, drop it off for composting, or dig it into your own composter. The anaerobic bacteria have no benefit to the compost or your garden soil as they will die in an aerated environment. Bokashi is best considered a pre-process for composting, and a great way to start thinking about what you can save from the landfill. Regardless of where you live, if you are interested in doing your part to help the planet, composting is a great place to start.